This is one of my favorites. I’m not sure where it came from but I remember my mom making it in the summer and fall when everything was ripe and fresh from the farmer’s market. This year was my first year gardening and I was able to make it with things from my garden, I only had to get corn. It was an exciting day! 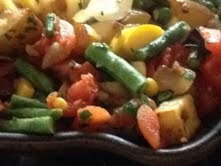 You can, of course, substitute any of the vegetables for whatever is fresh. I only require that you use tomatoes and all the fresh herbs. So fresh and tasty. Add onion, garlic, zucchini and green beans and cook stirring occasionally about 2 minutes. Add corn, tomatoes, vegetable broth and herbs. Cover and cook until potatoes are tender, 3-5 minutes. This looks so good! I’ll have to run out to the farmers market and give it a go.